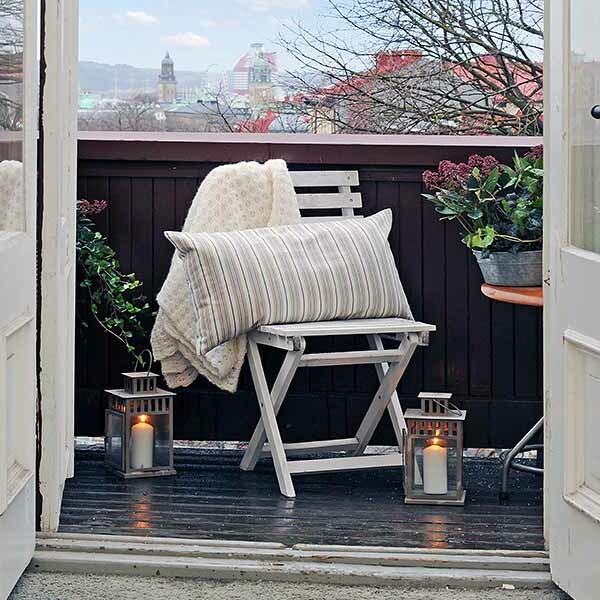 15 decorating ideas for your balcony, small deck or patio from Swedish designers will help create warm and cozy outdoor rooms and add more fun to spring decorating. Neutral or light and bright decorating colors, warm home fabrics, green plants, soft cushions for outdoor furniture, lanterns with candles and blooming flowers are spring decorating ideas for creating inviting and beautiful outdoor rooms. 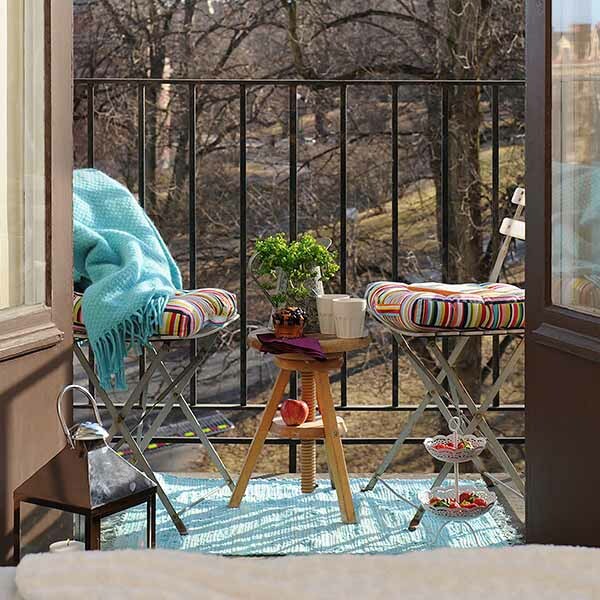 Green plants and blooming in spring flowers are great for your balcony, small deck or patio spring decorating. 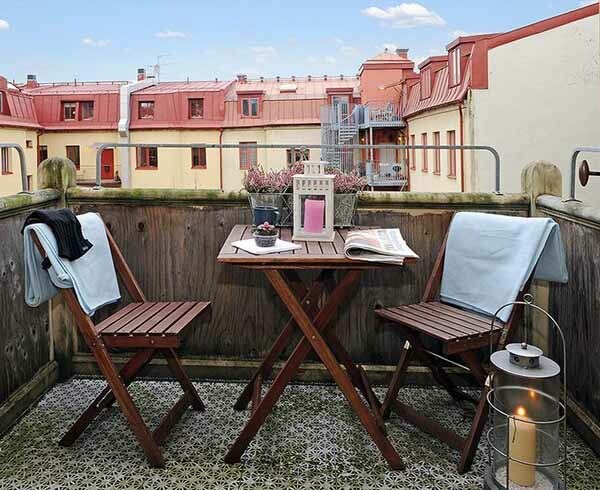 Your balcony is an extension of the house. 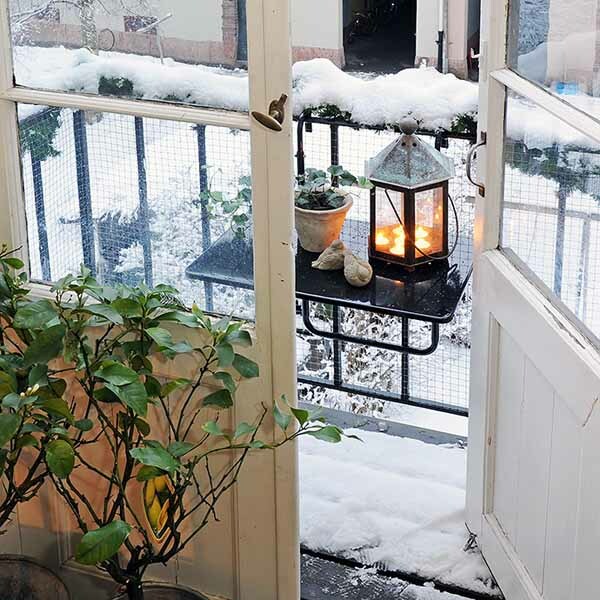 Charming and cozy outdoor rooms are a way to express your taste and demonstrate a sense of style. 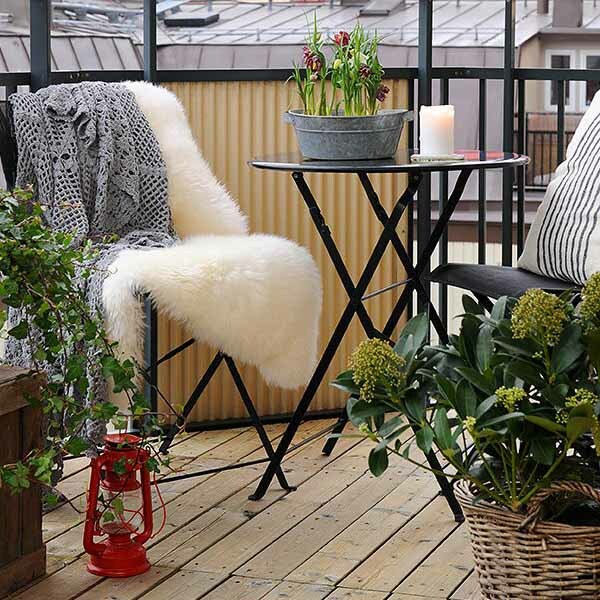 Here are 15 decorating ideas for your balcony, small deck or patio from Scandinavian designers can inspire you to explore outdoor decor in Swedish style and add gorgeous decorative accents to your outdoor rooms. Green plants are excellent even for early spring decorating. Green plants give your balcony, small deck or patio design fresh feel, connecting your home decor ideas with the nature. Green plants and flowers in planters can be placed along the edges of the balcony and along the perimeter of your deck or patio. You can hang small containers and colorful baskets with green plants and flowers, if your balcony, deck or patio is very small. Bright containers and baskets can add a splash of your favorite color to the balcony, deck or patio design, creating a spring-like look. Spring flowers and green plants create a gorgeous mix for bright and cheerful spring decorating. Remember to choose right seasonal flowers for your balcony, desk or patio design, considering the amount of sunlight and shade your outdoor room gets. Well selected flowering plants will thrive in the right environmental conditions. Create a bamboo fence along the outer edges of the balcony, adding natural material and artistic touch to your outdoor rooms design. Bamboo is inexpensive, can be secured to wrought iron or wood, and look very decorative, especially if you vary the height of the bamboo fence. A table and a couple of chairs made of wood or wrought iron. Light paint colors look perfect for bright spring decorating, creating optimistic atmosphere in your outdoor rooms. A vase with flowers, interesting container or basket with a green plant, unique lantern, candles or small garden decorations can make lovely table centerpieces for spring decorating. Soft cushions for furniture, cozy throw and floor rug add comfort and warmth to your outdoor decor. An area rug in beautiful light, neutral or bright colors, placed under the table or in the middle of the balcony is a way to add a splash of color, interesting pattern and warm texture to your balcony, small deck or patio design, attractively defining different areas and uniting outdoor decor. 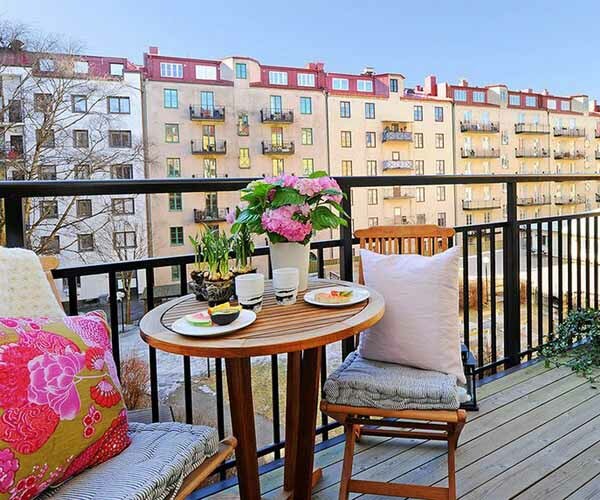 Beautiful and welcoming balcony, deck or patio design increase your living space and offer pleasant outdoor decor, creating a perfect retreat after a long day at work, which is well worth the expense, your time and effort.